For now, most of the world’s population is having a hard time trusting pharmaceutical industry. The ongoing scandals has generated uncertainty and mistrust towards the industry. Data misuse, controversial clinical-trial practices, commercialized drugs hidden side-effects and lack of transparency are some of the major problems that haunt the pharmaceutical sector. Patients are complaining about the authenticity of the drugs available in the market due to unavailable data and about the way they are developed and tested. But the real question is do we have a reliable option to overcome these problems in pharma industry? The answer is probably yes!! After making headlines across all the sectors, Blockchain is now all set to enter the healthcare and pharmaceutical field. Researchers are exploring ways to use this resourceful technology to reform the health industry. The vast potential of Blockchain offers solutions for Medicaid applications, medical records, payments, supply chain and many more. Let’s find out how is it planning to reform the pharmaceutical sector. Currently, pharma industry is struggling with a longtime problem of counterfeit drugs. Experts are trying to discover a method to restrict the growing tide of stolen or counterfeit medicines making entry in to the supply chain and ultimately trickling down to patients. Absence of any secure platform to securely, transparently and rapidly track the origin of medicines has become a nuisance for drug manufacturers. Further, information is not shared between systems and companies don’t know what happens to their products. Recalls are complicated and costly, and as a result companies cannot follow up with the patients. Pharmaceutical products must be traced in the entire supply chain covering companies around the world. This means there is no data sharing framework between retailers, suppliers, manufacturers and patients. The solution to this problem is available in the form of Blockchain technology, a software that can run across computers and generate a system that cannot be manipulated and provide record of transactions. Imagine Blockchain as a shopping mall and pharma companies are stores inside the mall. Stores and customers need a digital key and a digital token to run the store while following certain rules. Each transaction is recorded by the mall and broadcasted to all the stores. Everyone has same records of all transactions ever made. Trade partners can now share data in a transparent manner and validate each transaction. Everyone has a unique identifier and can control who can see their data. From drug makers to retailers to hospitals, everyone will have records about drug deliveries on a Blockchain. At each phase of the distribution process, the responsible network of pharma industry will vouch for the source and legitimacy of a drug shipment, making it tougher for robs to unload stolen medicines or for fraudsters to introduce bogus products. This will counterbalance the financial burden of regulatory compliance and lower the cost of bringing drugs to the market. The recent outbreak of Ebola and Zika have raised concerns about world’s healthcare system as even after a year of outbreak, we are still struggling to find the right medicine for the same. While many diseases are declared incurable yet researchers are still working on a cure. It’s evident now that the process of introducing a new drug into the market is costly and time-taking. Clinical trials cost billions and years to emerge with an effective drug. However, these trials often produce huge amount of data, which is shared between core team and other relevant organizations. With passage of time, the complexity of handling the trial grows and new challenges arise. Hence, proving the fact that the new drug is safe and efficient is not only a scientific challenge but a data challenge also. It is here that Blockchain will act as a robust solution and ensure data integrity of clinical trials right from start to end. Also, data integrity can hasten the process of drug development and its approval procedures besides convincing the patients and researchers that a drug is safe and efficient, and it does what it is meant for. Data volumes have augmented drastically in pharmaceutical corporations and it’s usual for mistakes to creep in when this data is shared. Access to a centralized data can accelerate the clinical trial procedure but a Blockchain-powered data ledger solution can be more successful. The technology can produce an enhanced level of trust and confidence among all parties, giving a noteworthy boost in data transparency. Blockchain safeguards data integrity by the cryptographic authentication of each transaction. This is vital to certify the genuineness of data falsification, data-restriction and data invention. Blockchain allows data traceability and is time-bound, making every information transparent to all users. Blockchain technology lets you create smart contracts i.e. establishing a network between machines for fast and secure communication and transactions. For instance, it can help hospitals to deliver invoices to patients via smart contracts, resulting in smart delivery without going through protracted intermediary. The same procedure can be utilized for sending reports to patient without getting it compromised because each data stored on Blockchain is turned into a permanent record and its access is limited. For instance, if a patient shifts to another city and loses all medical records available in paper format, he can access the information recorded on Blockchain. Now, the patient doesn’t have to undergo the same procedure to give data about his medical condition, making it easy for both medical facility and patient. This technology can be beneficial when used for order management in medical supplies. In times of emergency, when patients demand fast medical supplies and require middlemen to get the supplies, with Blockchain, the need of middlemen will be evaded. Contemporary technologies do not completely meet the expectation required currently. There limitation in sectors like interoperability, security and privacy restricts their productivity. Also, the healthcare accounts at present are fragmented due to deficiency of common architectures. By applying Blockchain technology, healthcare centers can easily deliver a structured set of data, which can then be stockpiled in a countrywide distributed ledger. This will ultimately allow easy access to real-time patient health statistics and abandon the load and expenditures involved in data reconciliation. It will also destroy irregular data standards and lack of compatibility across health data exchange network. Blockchain technology is offering solution to every significant industry in the world. Whether it is education or cyber security, this technology is capable enough to mark its impact everywhere. Several companies in healthcare sector are also using Blockchain to bring some reform in this sector. Let’s have a look at these companies. It is a virtual medical network administered by a Blockchain Token that delivers smart contracts for patients. It allows patients to communicate with healthcare providers directly and receive medical information or vice versa. This patient-oriented medical networks let them pay bills, contact suppliers with ease. Though this kind of initiative is new to the industry but has the capability to boom in coming years. The MediLedger Project by Chronicled aims to integrate leading Pharmaceutical Manufacturers and Distributors via Blockchain technology. 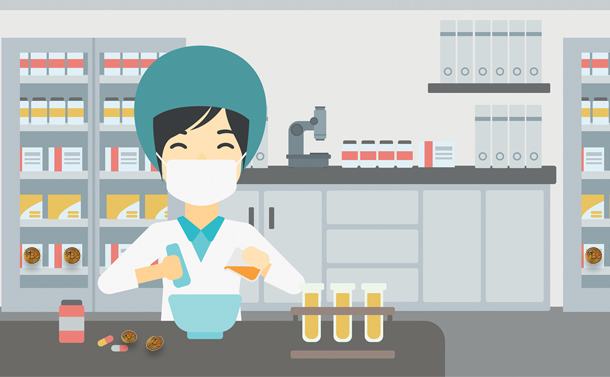 Pharma industry is currently facing several problems and this platform aims to solve all them by tracking and tracing regulations, and offering perfection in the overall operation of the supply chain. ‘Big four’ professional services firm Deloitte launched a one-stop Blockchain software platform focused on different sectors like healthcare, logistics, corporate voting etc. For now, the focus is particularly on the supply chain of pharmaceutical drugs in terms of drug safety, drug channels and public safety. The Blockchain technology can be used to identify the process of drug manufacturing, how drugs reach from manufacturers to consumers and the method to address end-consumer issues with drugs. By executing Blockchain technology, pharmaceutical supply chain stakeholders can substantially tweak their productivity while dispensing certifiable treatments across the globe. Even patients can authenticate drugs by individualistically validating them. All things considered, a transparent and protected supply chain is imperative for companies paying out billions of dollars on research and development to come up with groundbreaking formulas and for patients who are dependent on life-saving drugs. However, Blockchain technology cannot turn into a magic wand to resolve business problems, emerging in the highly interrelated and fast-changing digital health environment. It is still in its emerging phase of development but will gradually offer sufficient care, supplementary protection, and enhanced transparency to every party involved in the system.